Garfield Campsite could not feel further away at this point. The White Mountains of New Hampshire and I are currently separated by a body of water slightly larger than Garfield Pond- the Atlantic Ocean. I’m spending the fall semester of my senior year abroad in the historic capital city of Scotland. Edinburgh is a beautiful, bustling, cosmopolitan city filled with incredible people, food (haggis is actually quite tasty! ), and architecture. Staring out the window of Black Medicine Coffee, sipping an espresso, looking at double-decker buses pass by is quite a marvelous experience. I left off the last post talking about how caretakers operate on a day-to-day basis. How we use the simplest tool possible to accomplish the job at hand. City life makes me realize even more how valuable a life experience Garfield was. In a world filled with BlackBerrys and iPhones, where countless people rely on overly complex apps to accomplish elementary tasks, it’s refreshing to have lived the dichotomy. For example, Mike, Sally, Steph (13 Falls caretaker), and I constructed a stone waterbar and the beginnings of a stone staircase. We used nothing more than a shovel, pickmattock, and a few rockbars to move around rocks weighing hundreds of pounds. On the door to the caretakers office there is a quote by Edward Abbey that speaks to this point: “High technology has done us one great service: It has retaught us the delight of performing simple and primordial tasks - chopping wood, building a fire, drawing water from a spring.” As polarizing as Abbey may be, there are few who would venture into the woods and would completely disagree with this statement. To live a life where all you have is what you can carry on your back is truly remarkable. Around four o’clock everyday people would begin the journey past the Garfield water source, up the spur path, and into the campsite for the night. This was a great time of day; meeting the hikers passing through Garfield may have been my favorite part of the job. People from all over the world with all sorts of backgrounds would find their way up Mt. Garfield. I met everyone from the first time backpacker to a well-known climber with a PhD in outdoor education. In the civilized world, these differences may be too great for these people to be friends or acquaintances, but in the White Mountains they were all united under a love for nature and trails, especially the Appalachian Trail upon which you find a rare bread of hikers. 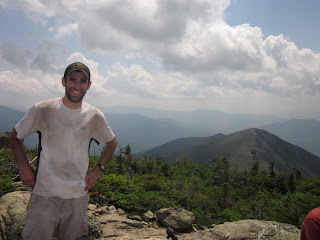 I particularly enjoyed chatting with thru-hikers; they were a fascinating bunch. I particularly remember Tim who recently retired from a life of serving our country in the armed forces. His philosophy on trail was, “I hike until a feel like resting and I rest until I feel like hiking.” He did not care how long it took him to get from Springer to Katahdin; he just loved being outdoors. Another man, an aspiring novelist, was hiking the trail before he was going to move in with his mother and sister. They both had developed severe illnesses and were going to require his full time care. The first thing he said to me as he walked into the campsite was “I’m living the dream” and his spirit only got better from there. 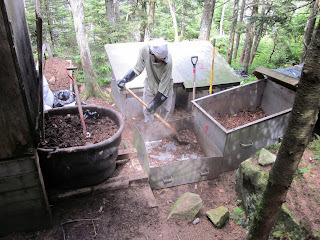 Composting was an exceptionally rewarding aspect of the job. Although at first it was a little bit gross, seeing the tangible benefits of my actions in real time made composting in the end an enjoyable experience. I loved discussing the composting process with guests as they came in and out of the site and was always proud to inform people that one of my composting runs was cooking near 130 degrees. As corny as this sounds, I will often wonder how my composting runs are doing. I’m a bit disappointed that I will be unable to spread them around the campsite. Alas, maybe I can find a composting toilet in Edinburgh to work on!